A bhikkhu (from Pali, Sanskrit: bhikṣu) is an ordained male monastic ("monk") in Buddhism. 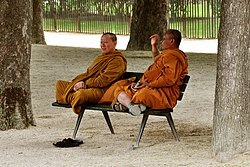 Male and female monastics ("nun", bhikkhuni (Sanskrit bhikṣuṇī)) are members of the Buddhist community. The lives of all Buddhist monastics are governed by a set of rules called the prātimokṣa or pātimokkha. Their lifestyles are shaped to support their spiritual practice: to live a simple and meditative life and attain nirvana. Bhikkhu literally means "beggar" or "one who lives by alms". The historical Buddha, Prince Siddhartha, having abandoned a life of pleasure and status, lived as an alms mendicant as part of his śramaṇa lifestyle. Those of his more serious students who abandoned their lives as householders and came to study full-time under his supervision also adopted this lifestyle. These full-time student members of the sangha became the community of ordained monastics who wandered from town to city throughout the year, living off alms and stopping in one place only for the Vassa, the rainy months of the monsoon season. [266-267] He is not a monk just because he lives on others' alms. Not by adopting outward form does one become a true monk. Whoever here (in the Dispensation) lives a holy life, transcending both merit and demerit, and walks with understanding in this world — he is truly called a monk. For historical reasons, the full ordination of women has been unavailable to Theravada and Vajrayana practitioners, although recently the full ordination for women has been reintroduced to many areas. In English literature before the mid-20th century, Buddhist monks were often referred to by the term bonze, particularly when describing monks from East Asia and French Indochina. This term is derived Portuguese and French from ja bonsō, meaning 'priest, monk'. It is rare in modern literature. Buddhist monks were once called'talapoy or talapoin from French talapoin, itself from pt talapão, ultimately from mnw tala pōi, meaning 'our lord'. The Talapoys cannot be engaged in any of the temporal concerns of life; they must not trade or do any kind of manual labour, for the sake of a reward; they are not allowed to insult the earth by digging it. Having no tie, which unites their interests with those of the people, they are ready, at all times, with spiritual arms, to enforce obedience to the will of the sovereign. The talapoin is a monkey named after Buddhist monks just as the capuchin monkey is named after the Order of Friars Minor Capuchin (who also are the origin of the word cappuccino). Theravada monasticism is organized around the guidelines found within a division of the Pāli Canon called the Vinaya Pitaka. Laypeople undergo ordination as a novitiate (śrāmaṇera or sāmanera) in a rite known as the "going forth" (Pali: pabbajja). Sāmaneras are subject to the Ten Precepts. From there full ordination (Pali: upasampada) may take place. Bhikkhus are subject to a much longer set of rules known, the Pātimokkha (Theravada) or Prātimokṣa (Mahayana and Vajrayana). In the Mahayana monasticism is part of the system of "vows of individual liberation". These vows are taken by monks and nuns from the ordinary sangha, in order to develop personal ethical discipline. In Mahayana and Vajrayana Buddhism, the term "sangha" is, in principle, often understood to refer particularly to the aryasangha (Tib. mchog kyi tshogs), the "community of the noble ones who have reached the first bhūmi". These, however, need not be monks and nuns. The vows of individual liberation are taken in four steps. A lay person may take the five Upāsaka and Upāsikā vows (Tibetan dge snyan, dge snyan ma "approaching virtue"). The next step is to enter the pabbajja or monastic way of life (Srt: pravrajya, Tib. rab byung pronounced rabjung), which includes wearing monk's or nun's robes. After that, one can become a samanera or samaneri "novice" (Skt. śrāmaṇera, śrāmaṇeri, Tib. dge tshul, dge tshul ma). The last and final step is to take all the vows of a bhikkhu or bhukkhuni "fully ordained monastic" (Sanskrit: bhikṣu, bhikṣuṇī, Tib. dge long, dge long ma). Monastics take their vows for life but can renounce them and return to non-monastic life and even take the vows again later. A person can take them up to three times or seven times in one life, depending on the particular practices of each school of discipline; after that, the sangha should not accept them again. In this way, Buddhism keeps the vows "clean". It is possible to keep them or to leave this lifestyle, but it is considered extremely negative to break these vows. 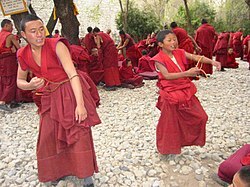 In Tibet, the upāsaka, pravrajya and bhikṣu ordinations are usually taken at ages six, fourteen and twenty-one or older, respectively. The special dress of ordained people, referred to in English as robes, comes from the idea of wearing a simple durable form of protection for the body from weather and climate. In each tradition there is uniformity in the colour and style of dress. Colour is often chosen due to the wider availability of certain pigments in a given geographical region. In Tibet and the Himalayan regions (Kashmir, Nepal and Bhutan) red is the preferred pigment used in the dying of robes. In Burma, reddish brown; In India, Sri Lanka and South-East Asia various shades of yellow, ochre and orange prevail. In China, Korea, Japan and Vietnam grey or black is common. 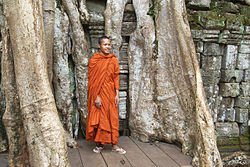 Monks often make their own robes from cloth that is donated to them. The robes of Tibetan novices and monks differ in various aspects, especially in the application of "holes" in the dress of monks. Some monks tear their robes into pieces and then mend these pieces together again. Upasakas cannot wear the "chö-göö", a yellow tissue worn during teachings by both novices and full monks. In Mahayana traditions, a Bhikṣu may take additional vows not related to ordination, including the Bodhisattva vows, samaya vows, and others, which are also open to laypersons in most instances. Saichō petitioned for a Mahayana ordination platform to be built in Japan. Permission was granted seven days after his death. and the platform was completed in 827 by his disciple, Gishin. Saichō believed the 250 precepts were for the Śrāvakayāna and that ordination should use the Mahayana precepts of the Brahmajala Sutra. He stipulated that monastics remain on Mount Hiei for twelve years of isolated training and follow the major themes of the 250 precepts: celibacy, non-harming, no intoxicants, vegetarian eating and reducing labor for gain. After twelve years, monastics would then use the Vinaya precepts as a provisional, or supplemental, guideline to conduct themselves by when serving in non-monastic communities. Tendai monastics followed this practice. Currently, priests (lay religious leaders) in Japan choose to observe vows as appropriate to their family situation. Celibacy and other forms of abstaining are generally "at will" for varying periods of time. After the Japan–Korea Treaty of 1910, when Japan annexed Korea, Korean Buddhism underwent many changes. Jōdo Shinshū and Nichiren schools began sending missionaries to Korea under Japanese rule, and new sects formed there such as Won Buddhism. The Temple Ordinance of 1911 (Hangul: 사찰령; Hanja: 寺刹令) changed the traditional system whereby temples were run as a collective enterprise by the Sangha, replacing this system with Japanese-style management practices in which temple abbots appointed by the Governor-General of Korea were given private ownership of temple property and given the rights of inheritance to such property. More importantly, monks from pro-Japanese factions began to adopt Japanese practices, by marrying and having children. In Korea, the practice of celibacy varies. The two sects of Korean Seon divided in 1970 over this issue; the Jogye Order is fully celibate while the Taego Order has both celibate monastics and non-celibate Japanese-style priests. Young Indian Buddhist monk in India. ↑ What is a bhikkhu? ↑ Buddhist Dictionary, Manual of Buddhist Terms and Doctrines by Nyanatiloka Mahathera. ↑ Buddharakkhita, Acharya. "Dhammapada XIX — Dhammatthavagga: The Just". Access To Insight. Retrieved 18 December 2012. ↑ Roberts 1837, p. 237. ↑ 11.0 11.1 how to become a monk? ↑ Clark, Donald N. (2000). Culture and customs of Korea. Greenwood Publishing Group. ISBN 978-0-313-30456-9. ↑ 18.0 18.1 Sorensen, Henrik Hjort (1992). Ole Bruun; Arne Kalland; Henrik Hjort Sorensen, eds. Asian perceptions of nature. Nordic Institute of Asian Studies. ISBN 978-87-87062-12-1. Roberts, Edmund (1837). Embassy to the eastern courts of Cochin-China, Siam, and Muscat: in the U. S. sloop-of-war Peacock ... during the years 1832-3-4. Harper & brothers. Inwood, Kristiaan. Bhikkhu, Disciple of the Buddha. Bangkok, Thailand: Thai Watana Panich, 1981. Revised edition. Bangkok: Orchid Press, 2005. ISBN 978-974-524-059-9. This article includes content from Bhikkhu on Wikipedia (view authors). License under CC BY-SA 3.0.